HAMAS 101 – Arab Palestinian Hamas Factsheet | Free Israel! Osama Hamdan : We [i.e., Hamas] are preparing for a confrontation [with Israel ], not only in preparation for Israeli aggression, because the entity is founded on aggression, but because the final goal of the resistance 8 is to wipe this entity off the face of the earth . This goal necessitates the development of the resistance’s until the entity has been destroyed. Note : Osama Hamdan’s terminology is similar to that of Iranian president Ahmadinejad and other senior Iranian figures, who repeatedly state that Israel will be wiped off the face of the earth. On August 6, Osama Hamdan, Hamas’s representative in Lebanon told al … goal of the resistance is to wipe this entity [Israel] off the face of the Earth. ..
al-Turabi… In this case, he affirmed “the legitimate goal of the Palestinians,” as defined by Hamas, that is, the annihilation of the Jewish state.. Both the Nazis and these Muslim fascists are totalitarians, seeking to conquer the world and commit genocide against Jews. … The primary radical Islamists are the Muslim Brotherhood, Al-Qaeda, Hamas, Hezbollah, and Islamic Jihad. A Hamas Web site published the videotape wills of two suicide bombers in which they pledge to drink Jews blood until they flee from Muslim land. By Nadav Shragai … which presents the video shown on the Hamas site after its victory in the Palestinian parliamentary elections. The video shows Idham Ahmed Majila and Maumin Rajab Rajab, who blew themselves up at the Karni crossing at the end of 2004. “My message to the hated Jews: There is no God but Allah,” Majala says. “We will hunt you everywhere, when you wake and when you sleep. We are a blood-drinking people and we know that there is no better blood than Jewish blood. When engaged in armed conflict it is difficult to ensure the safety of civilians. In fact, Hezbollah and Hamas purposefully operate in populated areas, often putting civilians between heavily armed terrorists and the Israeli military. Europe must take seriously the ideology of anti-Semitism coming out of the Arab and Islamic world. It must denounce the deliberate targeting of Jews by terrorist groups, whether it be al Qaeda or Hamas. (IsraelNN.com) Despite repeated calls by the Bush administration to end anti-Israel incitement in the Palestinian Authority media, the official newspaper of the PA continues to regularly publish hate cartoons against Israel and Jews. New York, NY, February 27, 2006 … The founding covenant of Hamas, the Palestinian terrorist group whose leaders are poised to take a central role in the governance of the Palestinian Authority, is committed not only to the destruction of Israel and the establishment of an Islamic state in its place, but to raw, unadulterated Jew-hatred. Adopted in August 1988, the Hamas Charter openly embraces the notorious anti-Semitic forgery, “The Protocols of the Learned Elders of Zion,” holding it up as evidence that Jews are innately greedy, manipulative and conniving, according to the Anti-Defamation League (ADL). The charter adopts classical anti-Semitic canards: Jews as plotting to control the world, Jews acquiring wealth by stealing, and Jews controlling the levers of power in media, government and finance. Such stereotypical anti-Semitic canards have been used through the centuries to defame and demonize Jews, leading to violence, pogroms and, ultimately, the Holocaust. The modern anti-Jewish animosity of Islamic movements goes much further than traditional Islam. Although Muslims have always viewed Islam as a superior religion, superseding Judaism, they did not consider Judaism as a heresy, which required eradication, as long as it did not challenge Islam’s rule. Historically, Muslims regarded Christianity as a greater threat than Judaism, and devoted greater attention to it in their polemical literature. However, due to the conflict with Israel, Judaism rather than Christianity has become the prime enemy for the Islamist organizations, drawing inspiration from anti-Jewish utterances in the Koran and from modern European anti-Semitism. A clear Zionist goal, aimed at forging history by hiding the truth about the so-called Holocaust, which is an alleged and invented story with no basis . . .. The invention of these grand illusions of an alleged crime that never occurred, ignoring the millions of dead European victims of Nazism during the war, clearly reveals the racist Zionist face, which believes in the superiority of the Jewish race over the rest of the nations. cAbd al-cAziz al-Rantisi, Hamas leader from Gaza, went further by denying the Holocaust, while simultaneously charging that “the Zionists were behind the Nazis’ murder of many Jews,” with the aim of intimidating and forcing them to immigrate to Palestine. Furthermore, he claimed that the Nazis “received tremendous financial aid from the Zionist banks and monopolies,” prior to their seizure of power and that “this great financial aid helped the Nazis build the military and economic force needed to destroy Europe and annihilate millions.” “When we compare the Zionists to the Nazis,” Rantisi concluded, “We insult the Nazis,” he concluded. Reviewing the life of the late Pope John Paul II, the Hamas weekly al-Risala concluded that his 1998 letter, in which he apologized to the Jews for the Holocaust was his “greatest crime”. Published December 22, 2010, issue of December 31, 2010. Meanwhile, many of Germany’s 4 million Muslims stay connected with events in the Middle East via cable television networks, such as Hezbollah’s Al-Manar and Hamas’s Al-Aqsa. These are anti-Semitic networks that promote Holocaust denial. Videos justifying the persecution of Jews and promoting child martyrdom for Islam are shown daily on these networks, fueling anti-Semitism among Muslim youth in Germany. “You cannot undo with education what these satellite broadcasts are doing,” said Matthias Kuntzel, an author and political scientist, in a phone interview from Hamburg. The programs are fed to Germany on Egyptian and Saudi Arabian satellites. Both countries have refused repeated German requests to stop transmitting Al-Manar. German law prohibits the dissemination of hate. Although Al-Manar was banned in 2008, private homes with satellite dishes continue to receive its programs, making the ban ineffective. Why, then, is Erlanger obsessed with this distinction? I suggest that what Erlanger is actually saying is that what is really bad about Hamas is not that it is a racist, terrorist group with genocidal intentions against Israelis but that it is an Islamist organization. If, after all, Hamas is exercising a just right of resistance motivated by Israeli misdeeds, how can it be condemned on those grounds? 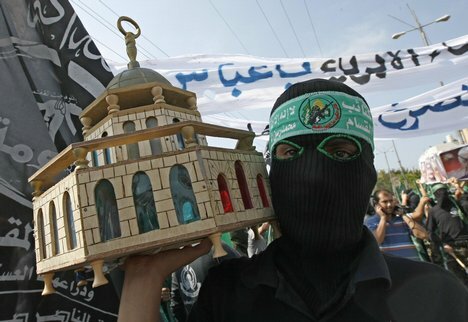 The trouble with Hamas is that it is a ‘right wing’ religious group rather than a ‘left wing’ nationalist one. [Mr. ACKERMAN…] Hamas has made clear again and again that they will not be held answerable for the hundreds of innocent civilians they slaughtered with bombs. They will not be held accountable for their overt racism and vile anti-Semitic bigotry. A crowd of more than 10,000 Palestinians Saturday heard denunciations of the PA leadership in the West Bank as infidels at a Liberation Party rally on the sports field of the Quaker-run Friends School in Ramallah. The party calls for re-establishing the caliphate, or Islamic state, across the Muslim world. “The caliphate is coming,” read a large poster on the wall of the field. 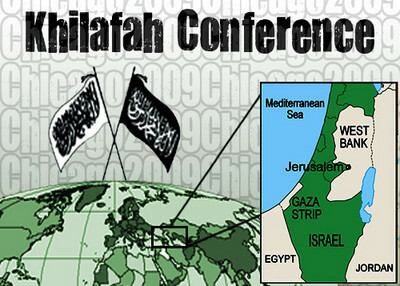 In the early 1990s, Hamas spokesmen dismissed doubts concerning the realization of a universal Islamic caliphate. For instance, Mahmud al-Zahhar, a Hamas leader in Gaza, claimed that Palestine had always been part of a greater Islamic state and that a distinct Palestinian state had never existed. A comparison between the religious Islamic past and the currently divided Arab world led Zahar to the conclusion that the framework of separate states had utterly failed. He even pointed to the formation of the European Union as an example of the world-wide trend of establishing supranational political units, which the Muslims should adopt as well. If the caliphs were able to control the Muslim nation in the age of the camel and the donkey, then al-Zahar assumed, that the task should be all the more easier today thanks to the modern means of communication and transport. Notwithstanding the movement’s pan- Islamic ambition, spokesmen still gave preference to the Palestinian component of their ideology, even within the framework of the pan- Islamic vision. Accordingly, some of its spokesmen even believed that Jerusalem, not Mecca, would become the capital of the future Islamic caliphate.40 Another example of the wavering between the Islamic vision and the distinct Palestinian identity was the debate between Hamas and al-Qai’da over the priorities of the Islamic struggle. To Mousa Abu Marzuk, Deputy Chief of Hamas’ Political Bureau in Damascus, HAMAS’ triumph is an important springboard towards the establishment of the Caliphate ­– a global Islamic state, where life would be dictated by the Shari’a. In a statement Abu Marzuk made on January 26, following HAMAS’ sweeping victory of the Palestinian legislative elections, he said that HAMAS, the Palestinian branch of the Muslim Brotherhood (MB), is reaping the fruits of its efforts over the last six decades. It was established in Palestine in 1936 – not in 1987, as most mistakenly think. Since then, the movement, according to Abu Marzuk, has carried out its political, social agenda, including Dawa (Prosetylization) and Jihad. As Palestinian Media Watch has reported this call for the killing of non-Muslims was a regular pronouncement by both Palestinian Authority (Fatah) and Hamas political and religious leaders for many years starting in July 2000. For years, sermons by religious leaders on official Palestinian Authority TV under Yasser Arafat and Mahmoud Abbas routinely presented the killing of Jews as a religious obligation and a fulfillment of the Islamic ideal. Due to PMW’s exposure of these sermons, which led to international criticism and pressure, Mahmoud Abbas, whose office controls PA TV, has been forced to prevent the broadcast of sermons calling for extermination of Jews on PA TV. The latest sermon of this nature on PA TV was in January 2010. […]see the section on PMW’s website documenting the PA and Hamas depicting the killing of Jews as an Islamic obligation. the Communists and their adherents. 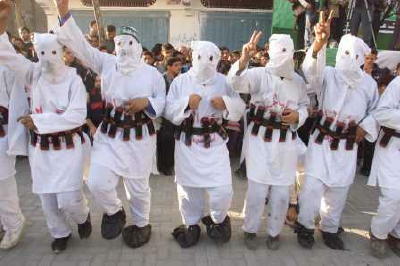 The brigade is Hamas’ (the totalitarian Islamic jihadists who proud themselves as being “democratically elected” government of the Arab Palestinians in Gaza) military wing, according to its own words and by experts. murder of Jews simply for the fact of that they are Jews. The bulletin was published to commemerate the anniversary of the death of Imad Akal, a senior Hamas official, killed in the Gaza Strip on November 24, 1993. The bulletin quotes Akal as saying: “We will knock on the doors of Heaven with the skulls of the Jews”. The bulletin depicts an axe shattering the word “Al-Yahud” (Jews) and splintering the skulls of Jews. 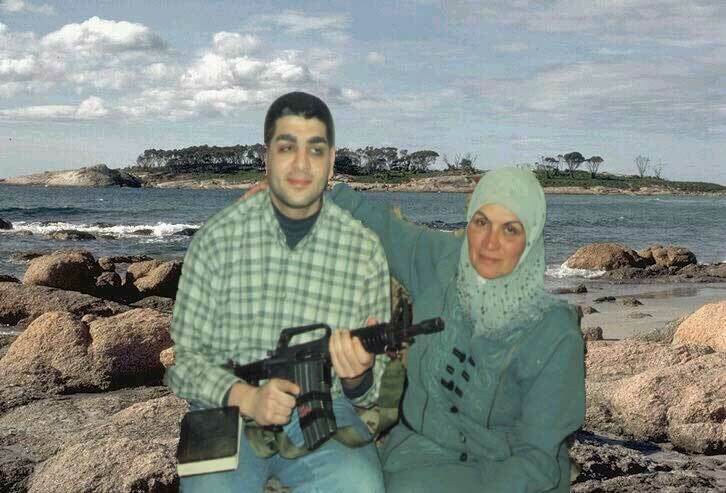 The words Al-Qassam are engraved on the axe. These include official attitudes and Hate, Jihadi Messages (like calls: to kill all Jews and Christians), posted since Aug/Sep/Oct 2010, still left on December 22, 2010. Sympathizing with Holocaust denial/deniers, perpetuating Nazi-type theories about Jews. Calling for [ethnic cleansing] expulsion of all Jews from the entire area. Ironically, or rather typically, these real Racist Arabs, actual Muslim bigots and hidden Nazis’ sympathizers use the terminology: “racism,” or/and “fascism” and even “nazism.” (coating their messages with connecting anti-radical-terrorists operation with something about supposed “against non-Jews” crap, along the lines of KKK’s David Duke language) – to demonize Israeli defenders. This entry was posted on December 23, 2010 at 2:18 pm and is filed under Uncategorized. You can follow any responses to this entry through the RSS 2.0 feed. You can leave a response, or trackback from your own site.